While working on new medical devices, engineers often need material or polymers for parts and devices to make new product i.e. functional and safe. While selecting the materials few parameters are kept in mind like cost, physical, chemical & biological properties of the material and regulatory concerns related to the material. Recently, few materials are on the watchlist of engineers, for instance, polyether ether ketone (PEEK), polyethylene and cyclic olefin copolymers (COCs), bioresorbables (polylactic acid (PLA), polyglycolic acid (PGA), polycaprolactone (PCL)) and fluoropolymers (polytetrafluoroethylene (PTFE), perfluoroether (PFA) and fluorinated ethylene propylene (FEP)) owing to their suitability for use in medical devices. 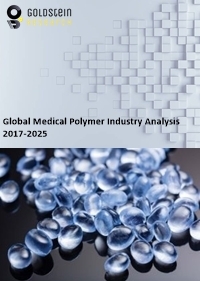 The global medical polymers market size was estimated at USD 12.56 billion in 2017, growing at a CAGR of 8.12% over the forecast period. Growing home based health care demand, continuously growing pharmaceutical device demand, increasing elderly population and increasing medical need among them along with rapidly spreading chronic diseases, technological advancements, affordable home health care systems with alternative treatment methods, and government initiatives associated with the cause will steer the medical polymers market in the forecast timespan. Volatility in the petrochemical based raw materials price due to depleting petroleum reserves, fluctuating crude oil prices and strict regulations imposed by various medical agencies, WHO, FDA, REACH, etc. regarding the product quality and prices may pose a restraint on the global medical polymers market. Medical fibers & resins include polyvinyl chloride (PVC), polypropylene (PP), polyethylene (PE), polystyrene (PS) and other thermoplastics and accounted for over USD 8.46 billion for the global medical polymers market in 2017 and will grow at over 7.67% CAGR, on the account of pervasiveness of cardiovascular issues, general medical conditions, infections, and other diseases, coupled with growing use of fibers and resins in spinal implants, cranial injuries, and hip and joint replacements, owing to benefits, such as improved biocompatibility and lower cost, over traditional materials. The demand for medical devices and equipment is expected to grow over the forecast period followed by packaging segment which is estimated to grow at a CAGR of 7.79% over the forecast period owing to its incorporation in the products, and medical disposable techniques. On the basis of region, North America dominated the global medical polymer market and accounted for USD 4.78 billion in 2017 owing to United States mature medical and pharmaceutical industry. While Europe tends to grow at the steady rate of 6.89% and will lose its share to APAC, Latin America and Middle East & Africa. Growing medical expenditure in China, India, Bangladesh, Indonesia, and Pakistan will encourage growth in Asia Pacific. The report covers the present ground scenario and the future growth prospects of the facility management market for 2017-2025 along with the market players’ analysis. We calculated the market size and revenue share on the basis of revenue generated from major players worldwide. Medical Polymer market is forecasted on the basis of revenue analysis, product benchmarking and strategic developments of key market players. Medical Polymer Market Outlook 2017-2025, has been prepared based on an in-depth market analysis from industry experts. The report covers the competitive landscape and current position of major players in the medical polymer market space. The report also includes porter’s five force model, SWOT analysis, company profiling, business strategies of market players and their business models. “Medical Polymer Market Report” also recognizes value chain analysis to understand the cost differentiation, pricing models to provide competitive advantage to the existing and new entry players. Our Medical Polymer Market Report comprises of the following companies as the key players Bayer AG, Evonik Industries, Celanese, DuPont, Dow Chemical, Eastman Chemical, Huntsman, Lubrizol, Ensinger, Trinseo, BASF, Arkema, Biomerics, DSM, Röchling.